Might be you remember a time when Fallout wasn't primarily played in first-person. While everyone's abuzz about the multiplayer chaos of Fallout 76, you pine for the days of exploring the post-apocalypse and engaging in turn-based battles from the isometric perspective of the series' first two games. You're not alone, as evidenced by well-received spiritual successors like Wasteland 2 or Atom RPG. And a new challenger is gearing up for its own trip to the nostalgia vault: Encased, a fascinating adventure set under the ominous cover of the Dome, a technological frontier that forever traps anyone with the guts, ambition, or orders to venture inside. Encased is the first endeavor by Dark Crystal Games, a small studio hailing from Saint Petersburg, Russia that includes ex-Larian developers who worked on the widely acclaimed Divinity: Original Sin series. And it makes no qualms about its primary inspiration. "There is obvious influence from the Fallout games, and other CRPGs from the golden era," says game director Viacheslav Kozikhin. "We're not really hiding it... honestly, every Russian game developer, at some point, dreams to make Russian Fallout. A lot of people have tried, and few people succeeded - so hopefully we will be one of them." Kozikhin also cites the impact of Roadside Picnic, the Strugatsky brothers novel that was the loose basis for the cult-hit S.T.A.L.K.E.R. survival shooters. The Dome is quite the intriguing mystery - a colossal, almost alien structure emerging from the desert wastes, covering a city that's become the proverbial tip of the iceberg for a vast underground network of chambers. As you can see in the story trailer above, the Dome is lorded over by the CRONUS Foundation, which uses cheery, '50s-style propaganda about progress to cover up what a shadowy signal hijacker likens to " a concentration camp." You join the Dome's population of roughly 27,000 citizens under the watchful eye of CRONUS, knowing full well that you'll likely never be able to leave. While going hands-on with a pre-alpha build of Encased, I was impressed with the most unique wrinkle in the customizable character creator: selection of your backstory from color-coded Wings that act almost like a caste system for the Dome's denizens. Your adventurer might hail from the ranks of militaristic enforcers serving the Black Wing, the White Wing's fleet of intrepid scientists, the rugged mechanics of the Blue Wing, the conscripted labor force of Orange Wing convicts, or the corporate ladder-climbers of the Silver WIng. Most of the civilized NPCs you encounter belong to one of these Wings, and the dynamic between your character and anyone you encounter has a lot to do with the way these Wings view one another. I chose to make my character a Silver Wing go-getter for their powerful skills of persuasion (I love when RPGs let you defuse conflict with your words), which unlocked plenty of conversation options to brown-nose people in positions of authority. Hey, anything to get ahead in this workaday wasteland. Though I only got to explore a small facility during my demo, it was packed with the kinds of characters and curiosities that make good RPGs so engrossing. I took a liking to the still-quite-early visuals, which resemble polished versions of the primitive 3D renders that define the old-school Fallout and Diablo aesthetics. The plentiful sidestories you'll find in the Dome are brought to life by vividly descriptive writing that kicks your imagination into gear, accompanied by some stylized stills that provide a great sense of place. While putting off the meeting that would introduce my first assignment, I managed to help a distressed White Wing man repair his broken android daughter (with vaguely disturbing results) and witnessed a Black Wing soldier lose his squadmate as they limped to safety from a shootout. Narrative and exploration seem to be the pillars of Encased, but it wouldn't be a retro RPG without some turn-based combat - which wasn't ready to be shown at this stage. Encased will be a single-player story where you only control your own character, though you will be able to build up a squad of followers that you can outfit with gear and set AI preferences for how they assist you. If you're so inclined, you can even convince your henchpeople to do all the fighting for you - surely something my Silver Wing yuppie would do. Granted, your choice of Wing will always influence your past and people's assumptions about you, but the course of the story is dictated by your actions rather than your origins. 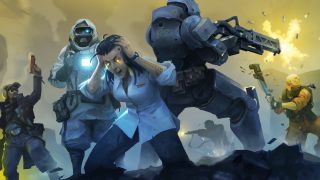 Like Pathfinder: Kingmaker, Encased is turning to Kickstarter to help fund its visions of "Russian Fallout," with plans to be in alpha by February 2019 and transition into Early Access on Steam shortly thereafter. Once there, development on the roughly 30-hour RPG will take as long as necessary. "Basically, you're making the game multiple times," says Kozikhin. "You make the game, you think it's ok; you show it to people, you figure out it's not ok, and you need to spend a while to fix everything," he laughs. If you're intrigued by this modern throwback to the heyday of isometric RPGs, you can check out the Encased Kickstarter or see which Wing suits you best with the amusing CRONUS employee test. From the font choice and colors to the cartoony line art used to depict your character in the test, it's clear that the team at Dark Crystal Games reveres the Fallouts of old. If you feel the same, you'd do well to keep an eye on Encased before it launches on PC, Switch, PS4, and Xbox One. For more old-school CRPG goodness, read up on how Pathfinder: Kingmaker evokes old-school RPGs with an empire-building twist.